Political Culture and Institutional Development in Nicaragua and Costa Rica: World Making in the Tropics crafts a synthetic approach to political culture by blending rationalist, structuralist, and culturalist theories. The book also deploys this synthetic approach to show how political cultural factors have shaped political and economic development in two paradigmatic cases of failure and success. Cambridge University Press (2005). "Cruz has written a magisterial work that truly goes beyond the countries under the microscope to a level of theoretical sophistication that should revolutionize the study of political culture and its influence on determining varying political outcomes. This book should be read and reread by historians, political scientists, Latin Americanists, and most of all, policy makers. Essential." "This well-researched and well-argued book is an important addition to the literature on economic and political development, not just for the two cases examined, but for the larger context of the developing world. This attempt to re-situate political culture as a centrally important explanatory variable adds a fresh perspective to current analyses, and Consuelo Cruz's way of conceptualizing political culture as a dynamic, interactive variable that is engaged with other factors (economic, institutional) makes for a sophisticated and novel analysis ... An important read for those interested in new approaches to studying comparative politics." 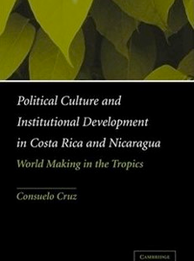 "Political Culture and Institutional Development in Nicaragua and Costa Rica: World-Making in the Tropics is a bold and beautifully written book. Consuelo Cruz's innovative interpretation of culture, colonialism, and normative scheming simultaneously breaks new theoretical ground, unearths new empirical material, and provides a novel explanation of divergent political trajectories in contemporary Central America. As such, this excellent book deserves a wide readership among scholars of regime politics, political culture, comparative historical processes, and Latin American politics." "Cruz ... eschews cultural determinism, cogently arguing, in forceful and sophisticated prose, that perspicacious leaders can rather rapidly remold national cultures and improve political institutions." "This is a pioneering and convincing analysis of how two very different political cultures, in neighboring countries, emerged and evolved. Cruz documents how and why political culture mattered for such key variables as the relative degree of a law bounded state, foreign intervention, democratization, and a consensually based welfare state. This major book should help invigorate historically based studies of political culture in comparative politics." "...sharp and insightful political narrative that will influence readers' views of the Sandinista." "Political Culture and Institutional Development in Costa Rica and Nicaragua is a masterpiece that combines new insights of political culture theory construction with an immense trove of historical facts about the two countries. Cruz shows a very rare creative ability in mixing a rich historical narrative with a new understanding of the role of political culture, which involves normative schemes, rhetoric, and imaginative possibilities...The analysis and conclusions add to our understanding of why Latin American nations, as a rule, seem unable to overcome the obstacles that would allow democratic consolidation in this region."